As Easter Monday is coming to an end, I'd like to tell you about a great Easter gift our six month old daughter received two days ago from her grandparents. In Sweden it's an Easter tradition to give your loved ones Easter eggs made of cardboard and filled to the brim with candy. 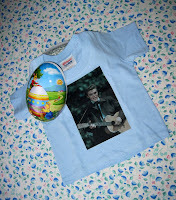 But when I opened the one intended for our daughter I found inside it a beautiful blue T-shirt with a picture of Elvis from Love Me Tender on it. Turned out my father had spent a lot of time on his computer looking for a an image that had sufficient resolution to be printed on a T-shirt. He and my mother then brought the image to a store that specializes in custom T-shirt printing. 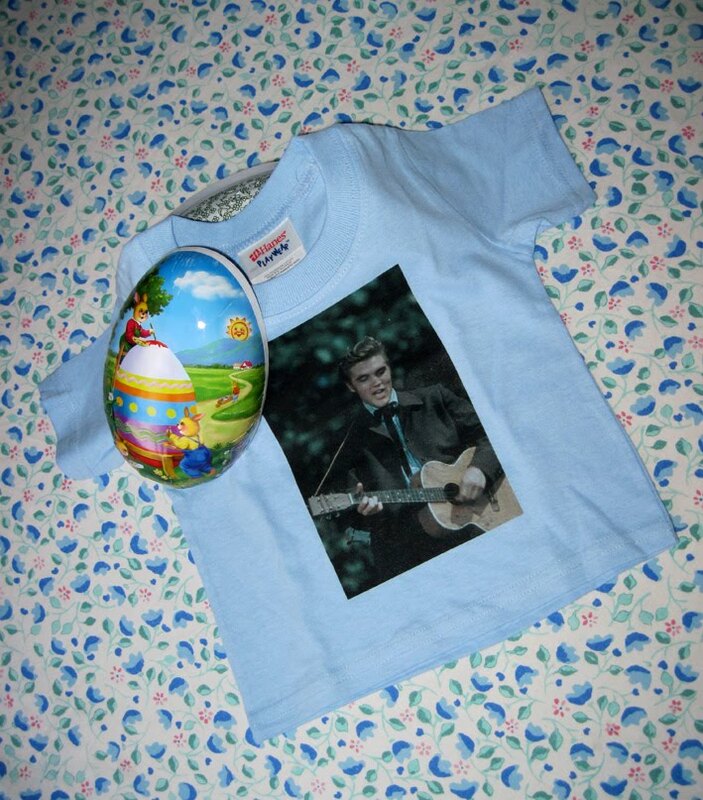 I'd like to take this opportunity to thank them both for the perfect Easter gift for our daughter. She'll look great wearing it a couple of months from now! 50 years ago today, Russian cosmonaut Yuri Gagarin became the first man to orbit the Earth. Twenty years later to the day the space shuttle era began with the maiden voyage of Columbia. Elvis Today joins the celebration by looking at the most played Elvis songs in space. Use of music to awaken astronauts on space missions is a NASA tradition that stretches all the way back to the Gemini program in the mid 1960's. Picked by flight controllers or by crewmembers' friends and family members, the playlist is ranging from rock, country, classical, bluegrass and jazz, to children's' choruses and songs from the countries of international crewmembers. 9/14/91 ―"Release Me" by Elvis Presley. In anticipation of deployment of Upper Atmosphere Research Satellite (UARS). 9/17/91 ―"Return to Sender" by Elvis Presley. In honor of expected landing. Two years later "Release Me" was used again on a Discovery mission (September 1993), together with "Heartbreak Hotel," although actually it wasn't Elvis who was singing this time, but well known Elvis impersonator Carl Walz on his maiden spaceflight. He had the unusual distinction of hearing his own voice singing for his first wakeup in space. The real Elvis made an appearance one year later, when "Hound Dog" was used to wake up the astronauts on another Discovery mission, on September 15, 1994. And would you believe the same song was used the same month the next year, on September 8, 1995, aboard the shuttle Endeavour. On the morning of December 3, 1996, "Return To Sender" was the choice to get the astronauts up on their feet, on a mission flown by space shuttle Columbia. Then, on the first shuttle mission to the International Space Station (ISS), "Hound Dog" was used for the third time, on December 12, 1998. Ten years later, on Mars 19, 2008, the wheel had come full circle, when "Burning Love" was again played in space, on the shuttle Atlantis for Mission Specialist Mike Foreman. No Elvis song has been used since then to wake up astronauts. To sum up, "Hound Dog" has been played three times, "Burning Love" and "Return To Sender" two times each, followed by "Release Me" and Are You Lonesome Tonight?" which were used one time each. Five Elvis' songs all together. Now what song would you choose? If I was an American astronaut, I bet it would be an emotional moment looking out through a window down at the North American continent, listening to "An American Trilogy." With all due deference to blogging, standing in front of a live audience talking about Elvis is a completely different ball game. That's what I felt while giving a presentation about his religious music in a church the other day. It really made me feel good. I arrived maybe two hours in advance to set up my equipment (computer, projector and amplifier) and check out the sound. Actually, one of my brothers helped me a lot, and worked as my technician during the lecture. That way, I could concentrate on what I was saying while he was playing the songs and movie clips. My other brother (who's a fan like me) was in the audience giving moral support, as was my father. With maybe half an hour left before I was to begin, people started to arrive and soon the church was packed to the last seat. And to think I'd been worried no one would turn up. Soon the verger dimmed the lights and I began my lecture called Rock Me Lord. In all honesty, I've done the presentation once before, but this was the first time in a church. 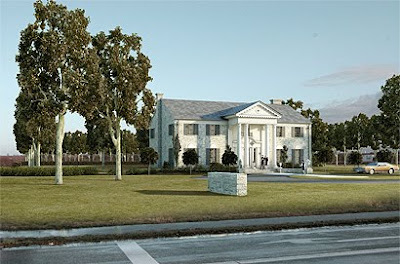 And it was a fantastic feeling being able to present and listen to Elvis' gospel music in its right element. "Do you want to hear one more of the same kind?" I asked after "Run On" and when the audience told me "yes" in no uncertain terms I played "If The Lord Wasn't Walking By My Side." The one performance that touched me the most was the live on screen version of "How Great Thou Art" from The 25th Anniversary Concert, featuring footage from April 1972 and sound from March 1974. With the church in darkness and Elvis powerful voice booming out of the loudspeakers placed beneath the screen, it was a majestic experience. After my presentation, which took about an hour, the priest talked about the Swedish versions of "How Great Thou Art" and "Amazing Grace," that both can be found in the Swedish Church's hymn book. She then led the audience through the songs with the help of the cantor who played the organ. It was a nice way to end an evening about Elvis and his gospel music. PS: If you want to know what songs I used, you can find the complete list in my post "A Gospel Performance" from June 27, 2009 (telling the story about the first time I did the presentation). Just a short post this time to let you know that I'm going to hold a lecture on Elvis' religious music once more, this time in a church. Nearly two years ago I did a presentation on the same subject in a parish house, during something called "summer church" close to where my parents live. Apparently someone in the parish remembered this, as I was asked a while ago if I was interested in talking about Elvis' gospel music again. So this weekend I've rehearsed my presentation and prepared my computer with pictures, music and movies. Although I'm a little bit nervous I find myself looking forward to Tuesday and 6.30 A.M. If you're passing by the church of Bjurum at that time I hope to see you in the audience.